"This is a recipe some coworkers of mine made for an outdoor Dutch oven cooking competition about 20 years ago and I've adapted to a conventional oven. My wife loves this and we've even had it as a main course although it is better suited to a side dish due to its rich flavor." Melt butter in a Dutch oven over medium-low heat. Mix onion, brown and wild rice mix, and water in the melted butter. Layer tomatoes over rice mixture; top with zucchini. Cover zucchini with Colby cheese. Mix sour cream, garlic, salt, Italian seasoning, red pepper flakes, and black pepper together in a bowl; spread over Colby cheese layer. Cover Dutch oven. Bake in the preheated oven until rice is tender and cheese is bubbling, about 45 minutes. 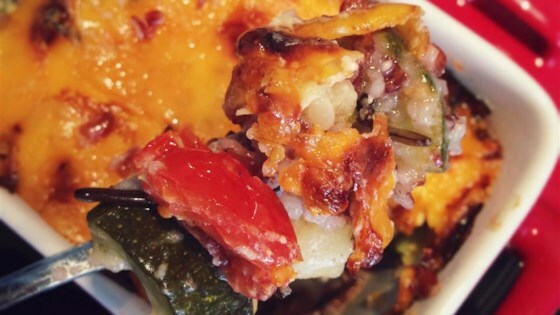 A tasty layered casserole of chicken and vegetables ready in under an hour. To make this in an outdoor Dutch oven, put the zucchini in before the tomatoes and use 10 bricks on top and 14 on bottom for 30 to 50 minutes.